My interest in English history is fueled by our Baptist History tours in the United Kingdom, and also by a growing acquaintance with the tragic decline of Christianity in the country of our heritage. These two volumes are the middle two of four but they cover the periods of history that greatly affect our Baptist heritage (1400-1700 & 1700-1900). 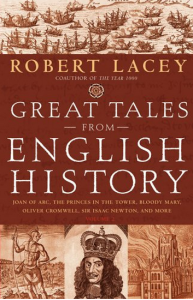 Lacey’s books are a compilation of short narratives about important events: Joan of Arc; Henry VIII; Sir Francis Drake and the Spanish Armada; the Great Exhibition; the Black Plague; etc. My favorite quote was from the life of Dr. Samuel Johnson (my grandfather’s first two names). “A woman’s preaching, he declared, is like a dog walking on its hind legs. It is not done well but you are surprised to find it done at all.” Not PC today, but funny nonetheless.